First Steps Nursery » First Steps Village Chichester & Brinsbury Now Open! First Steps Village Chichester & Brinsbury Now Open! Following successful launches over the past two weekends which included a special Royal Tea Party in celebration of the Royal Wedding and a unique animal handling experience, we are delighted to announce that our new, permanent First Steps Village in Chichester and our pop up First Steps Village in Brinsbury are now open! Both Villages have been thoroughly put to the test by our hundreds of little (and big!) visitors and we’ve had a lovely response from everyone. Thank you if you came along to help us celebrate. At First Steps Village Chichester we are based within our Ofsted Outstanding First Steps nursery on the college campus. 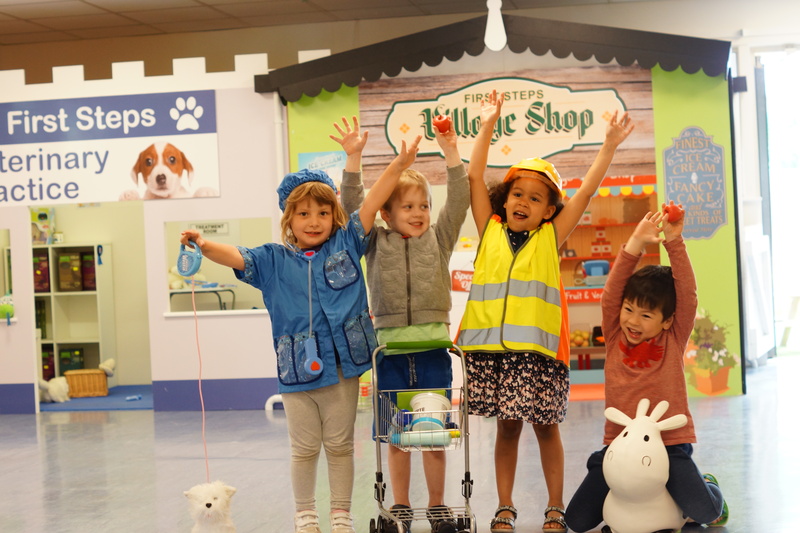 With a capacity of up to 25 children in one play session, we have lots of space for the children to run around, including an outdoor ‘farm’ area where our First Steps dog, rabbit and hobby horses can be found. Over at our pop up First Steps Village in Brinsbury, near Pulborough, we are based in a separate building opposite our nursery and adjacent to our friends at the Animal Care Centre. Here we have a capacity for between 15-20 children in a play session in our Village that includes ‘First Snips’ hair salon – a firm favourite with the children. We have some more unusual visitors to our Vet’s at First Steps Village Brinsbury too with a snake, lizard and turtle amongst the creatures the children can take care of! To book in, please just send us an email: firststepsvillage@chichester.ac.uk with your chosen Village, day and session time or you can call us on: 01243 530427. Alternatively you can message us via our Facebook page (First Steps Childcare) where we regularly post about First Steps Village. Our Villages are also available for private hire (events, play sessions or as an alternative venue for classes / groups) and for birthday parties. Our birthday party package starts at £99 for up to 20 children and includes invitations to send out, Village decorations, a balloon on a stick for all party guests and cupcakes / drinks for everyone. To find out more or discuss availability and your individual requirements, please get in touch. We look forward to welcoming you to First Steps Village soon.